Aaron’s Confusing Night – He Said What?! I’ve written before about how Aaron likes to keep lists of things in his life. He has a list of the times he watches programs that he has recorded. He keeps all sorts of sticky note lists around his room with info regarding his games. But perhaps the most interesting itemizing that he does is the very precise list he keeps of when he goes to bed and when he gets up. He has pages and pages of this information, somehow necessary to him and very important. Aaron arranges his bed in a specific order every night, too. He sits up and reads one of his Handy Answer Books every night before bed. He wears his sweater along with either his long or short pajamas. He wears his watch and ring, as well as his glasses. He leans on his “husband” pillow, the new black fuzzy one that he recently got at Target when he went in search of Mike and Ikes. On his lap is another pillow on which he rests his book. At his feet is his long body pillow that he sleeps on during the night. Beside him he places his back scratcher as well as the little towel he constantly carries……..the one he wipes his hands on when he feels like they are messy……..because he can’t abide having messy hands. He will read awhile, depending on how sleepy he is, and then when it’s time for bed he will get up and clean off his bed, putting everything back in its precise place. He’ll place his long pillow on the bed where it belongs for him to use during the night, with the zipper always on the left side. Always! He’ll remove his ring and his glasses and his sweater, also putting them in their proper spots. He’ll plug in the baby monitor so that we can hear him in our bedroom if he has a seizure. And just before he climbs into his bed, he will open his notebook to write down the exact time that he is going to now turn off the light and call it a night. 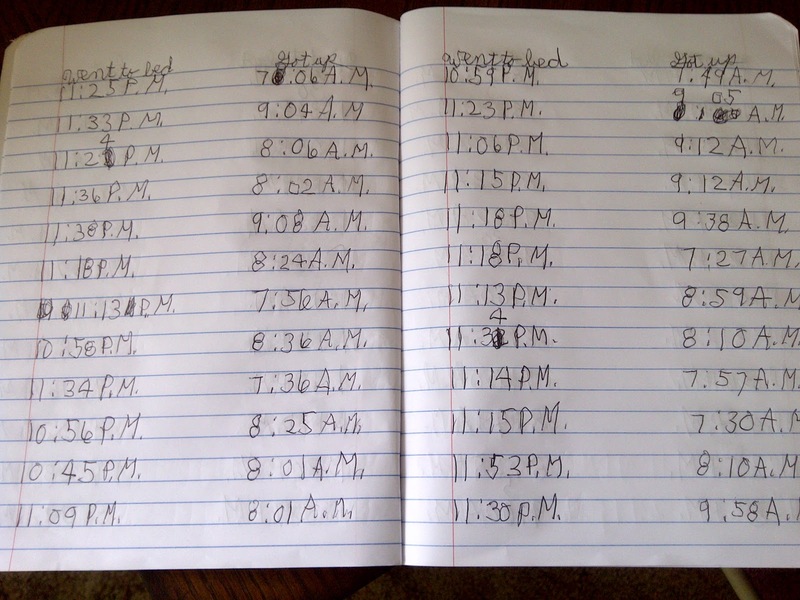 The first thing he does the following morning is to open that same notebook that he keeps by his bed and write down the precise time that he wakes up. This is Aaron’s routine. Every. Single. Night. Every. Single. Day. What?! “I had all my stuff on and everything was still around me! I had on my glasses and my ring and my watch and my sweater!” With this, Aaron began to laugh. He thought this was all just too funny. He went on, “Around me there was my pillow that I lean on and my pillow on my lap and my pillow at my feet and my towel and my back scratcher! !” And he laughed even harder, which made me laugh. He had fallen asleep while reading and then woke up to this unusual scene. He said, “I woke up because something was poking me in my back! It was my back scratcher!” More laughter………..from both of us. He was still amazed at this situation and still laughing, when it hit me. I wondered about his notebook, so I asked him what time he wrote down for when he went to bed and when he got up. He told me that he wrote down the first time he got up……3:33……..as well as the second time he got up, at 8:12. Later, after he was gone for the day, I opened his notebook and sure enough, there it was……..both times. 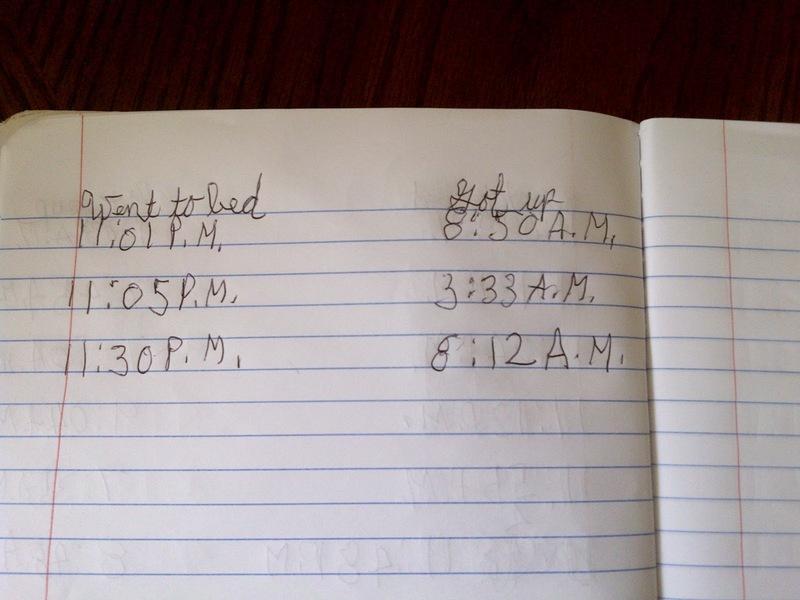 I’m not sure about the going-to-bed times, but he did write down the two times that he got up. Yes, it was confusing, Aaron. And to our Aaron, confusing is unacceptable……..and sometimes very funny!